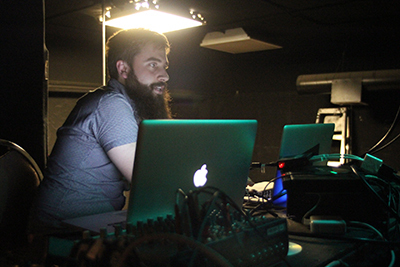 Justin Botz, a second-year media student, treated his audience to a top-notch solo performance as part of Rhinofest, Chicago’s oldest multi-media fringe festival. Botz kept the audience mesmerized with a thirty-minute one-act play he authored, Dreams of a Possible End. The performance included musings of an apocalyptic end as well as song, sound, and video projection that created a mood that ranged from humorous to awkward to ominous. 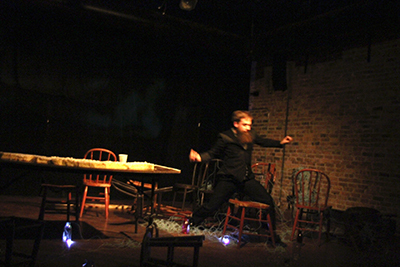 Botz’ physicality as he traversed the stage in large steps frequently throughout the performance added a sense of determined desperation to the paranoid character he created. Botz’ performance has another showing tonight at 7:00 p.m. To find out more about Rhinofest and for directions to the theater, click here. Botz checking the technical aspects of the performance before the show. Botz traversing the stage with his character’s signature steps. 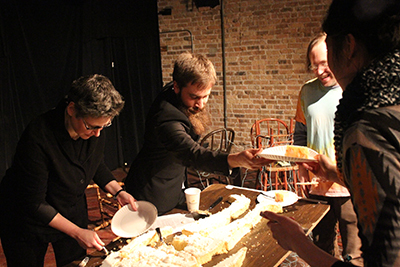 Rhinofest cofounder and InterArts faculty member Jenny Magnus helps Botz hand out cake, featured in the performance, after the show’s end. 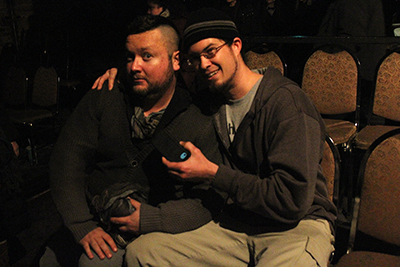 Media students Leo Selvaggio and Brent Koehn after the performance.